High Point is a neighborhood of Delridge in West Seattle. The name is also a description of the area - it is Seattle's highest point at over 500 ft. above sea level. In 2003, High Point was completely overhauled and rebuilt to have new roads, houses, and greener infrastructure. These recently built homes for sale range from townhouses and condos to single families. 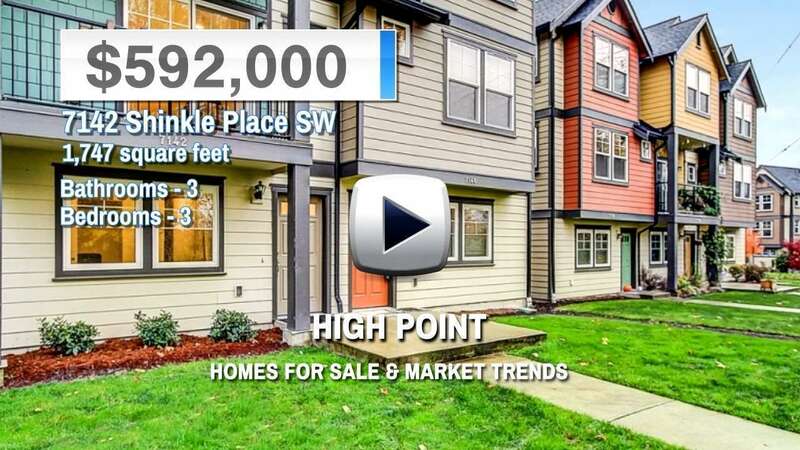 High Point's location along Delridge Way means a quick commute to the West Seattle Bridge and major highways. The neighborhood shares its northern border with Camp Long and the West Seattle Golf Course. 4 Beds | 3 Baths | 2074 sq. Ft.
3 Beds | 3 Baths | 1840 sq. Ft.
1 Beds | 1 Baths | 820 sq. Ft.
4 Beds | 3 Baths | 2081 sq. Ft.
4 Beds | 3 Baths | 2069 sq. Ft.
2 Beds | 1.75 Baths | 964 sq. Ft.
4 Beds | 2.75 Baths | 1900 sq. Ft.
Blue Summit Realty has the most accurate and up to date High Point real estate listings on the web. Currently there are 10 homes for sale, 2 condos for sale, in High Point. Of the 12 total High Point residential listings for sale 0 are bank owned, 0 are short sales, 0 are new construction, and 0 are townhomes. The price ranges from $385,000 to $0 with a median list price of $562,150 and median sold price of $569,038. Make sure to refine your High Point real estate search by property type, price, square footage, bedrooms, bathrooms and more with the search tool above or view the High Point listings on our interactive map. Our High Point real estate listings were updated 7 minutes ago.